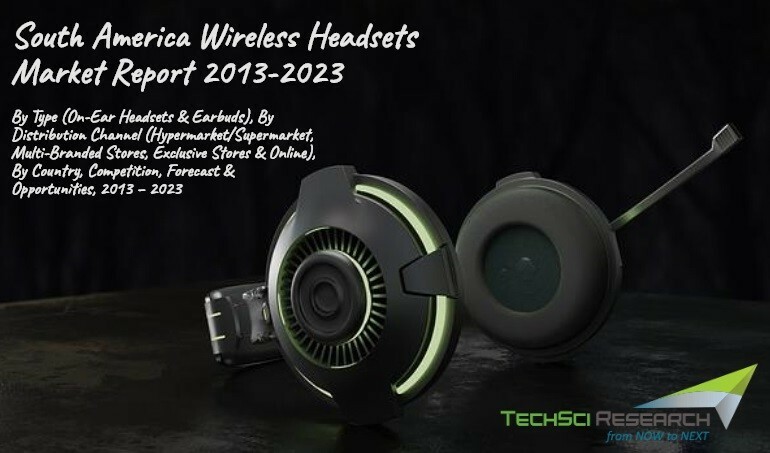 According to TechSci Research report, “South America Wireless Headsets Market By Type, By Distribution Channel, By Country, Competition, Forecast & Opportunities, 2013 – 2023”, South America wireless headsets market is projected to register a CAGR of over 11% during 2018 – 2023. Advanced connectively options with electronic devices such as laptops, smartphones, televisions and tablets are pushing the sales of wireless headsets in the region , Brazil Wireless Headsets Market , Argentina Wireless Headsets Market , Colombia Wireless Headsets Market, . On-ear segment emerged as the major revenue generator in South America wireless headsets market in 2017 and is forecast to maintain its market dominance through 2023, backed by their product awareness, lightweight and comfortable. Brazil dominates the region’s wireless headsets market, followed by Argentina, owing to higher per capita income and consumer preferences towards wireless headsets. According to the World Bank, internet penetration increased from 58.32% in 2015 to 60.87% in 2016 in Brazil. As more and more people are preferring to enjoy online services like listening to music and watching videos, South America wireless headsets market , Brazil Wireless Headsets Market , Argentina Wireless Headsets Market , Colombia Wireless Headsets Market, is anticipated to register growth in the coming years. Multi-branded stores account for nearly half of the market, as they offer multiple option of brands and additional discounts, thereby attracting a huge customer base. “Rising smartphone user base in countries such as, Brazil, Argentina and Colombia is significantly contributing towards the growth of wireless headsets market in South America region, as they help in creating a personal space and staying focused. Moreover, increasing sophistication of headphones & earphones, growing organized retail and e-commerce industry, and rising sales of mobile devices such as tablets, laptops and MP3 players would positively influence the region’s wireless headsets market during forecast period.”, said Mr. Karan Chechi, Research Director with TechSci Research, a research based global management consulting firm. “South America Wireless Headsets Market By Type, By Distribution Channel, By Country, Competition, Forecast & Opportunities, 2013 – 2023” has evaluated the future growth potential of wireless headsets market and provides statistics and information on market structure, size, share and future growth. The report is intended to provide cutting-edge market intelligence and help decision makers to take sound investment decisions. Besides, the report also identifies and analyzes the emerging trends along with essential drivers, challenges and opportunities present in South America wireless headsets market.